Wipe the sleep from your eyes: it's time to go back to work - and, while you're at your desk, why not check out the latest happenings in East County? The Death Star is for sale: are there any appropriate Star Wars references? 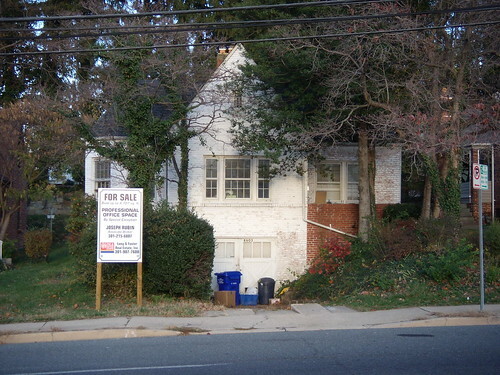 PRICE INCLUDES DRUM KIT AND VEGAN RECIPES: For just $899,000, you could have your very own punk house in Downtown Silver Spring. The Death Star, a former landmark of the local music scene which hosted shows until being booted out for redevelopment as a medical office in the summer of 2006, was just put up for sale. Located on Cedar Street a block from the Majestic, the house hasn't exactly been vacant for the past year and a half, but it's unclear what's happening inside. Walking by Saturday afternoon, I saw a middle-aged woman milling about, though I'm not sure what she was doing there. The Death Star's original operations, meanwhile, have moved to the newly-christened Corpse Fortress a few blocks away. PUTTING THIS STORY TO BED, FOR NOW:It's been a weekend of ups and downs at the 9:30 Club. Sunday, the ongoing controversy stirred by Seth Hurwitz' counter-proposal for the Fillmore music club on Colesville Road made the front page of the Post Style section. But today, any attention that might've gotten has been eclipsed by news that the guitarist of a popular emo band was found dead behind the club Saturday afternoon. There will be a great crying and gnashing of teeth on Ellsworth Drive in the coming days as the emo kids who've flocked here for the past three years begin to mourn. And in deference to that . . . we're going to put the Fillmore aside for a little while. what's the most unlikely target for an internationally-known street gang? find out AFTER THE JUMP . 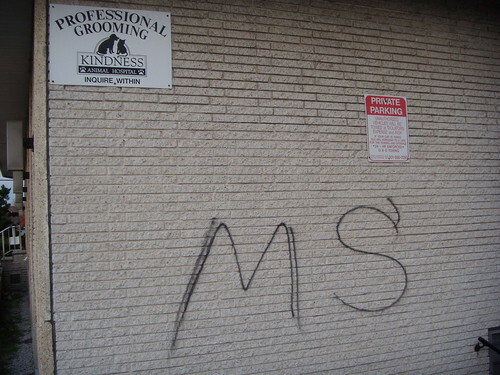 . .
MS-13 graffiti covers the side of a veterinary hospital in Wheaton. VETS TARGETED BY GANGBANGERS: Local resident and infamous photographer Chip Py alerted us to this MS-13 graffiti on the side of the Kindness Animal Hospital at Amherst Avenue and University Boulevard in Wheaton. Based in El Salvador but well-established in the D.C. area, MS-13 has been tagging various empty walls around East County for a few years now. There isn't too much of a story here - except that, if I were the owner of this veterinary hospital, I'd be disappointed that the taggers couldn't been a little more creative.